Fee Fi Fo Fum, I smell free spins and bonus wilds and a whole range of other cash rewards in this online slot game. 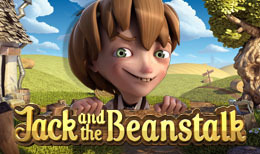 Join Jack and his friends to defeat the evil giant at the top of the beanstalk and spin your way through beanstalk and goat symbols in this 5 reel fairy tale bonanza. Game developer NetEnt has been a leading provider for premium gaming solutions for over 20 years to some of the world’s most popular online casino operators. The team at NetEnt are a bunch of talented and experienced individuals that take pride in delivering the best gaming experience possible to their gamers. NetEnt has passed some terrific milestones in it’s history and has continues to dominate the online casino industry. NetEnt provide a range of games no matter what your style of gaming is from simplistic games to complex games. This popular children’s story has transformed into 5-reel 20 payline slot game with 10 levels. The game still tells the same story of Jack and the Beanstalk with one slight difference, there’s no scary giant chasing you down the beanstalk. The symbols in the game include Jack, a goat, a two-headed ogre, axe and water pail alongside high value symbols the deck of cards ranging from 10 to A. You can select how much you wish to bet from 20p to £100 per spin. The game also offers an Auto Play option which you must select your bet and how many spins you wish to play for and the game will play automatically. Auto play can be ended at anytime during the game by pressing the ‘Stop’ button. The Walking wild is the wild symbol and whenever it appears on the reels you will be awarded a re-spin, the re-spin feature will continue for as long as the wild symbol is on the reels. The wild symbol substitutes all other symbols in the game except for the scatter and key symbols. Any wins you get with the wild symbols will pay 3 times worth. The treasure chest is the scatter symbol and 3 or more of these will trigger the free spins feature. You will also be granted 5 extra free spins when the 3 or matter scatter symbols appears. If you collect 3 key symbols it will make the next Wild a Stacked Wild of 2 money bag symbols, six key symbols equals stacked wild of 3 golden hens and 9 key symbols will result in Expanding Golden Harps.